We are a small British Shorthair (hobby) cattery situated in Almere, The Netherlands. The British Shorthair is one of the largest domestic cat breeds and is rather popular due to its round features (this breed is often nicknamed the Teddybear). 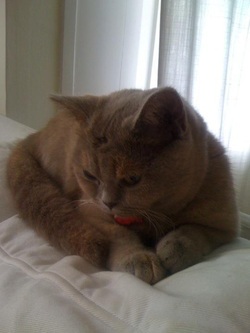 We wanted a quiet and loving cat and the British Shorthair fits those requirements. They are relatively calm but that does not mean that they are boring or aloof. They make sure they are part of the family. Our cats always wants to be in the same room as us and are always actively involved in what we do. British Shorthairs are said to be very loyal as well and tend to bond with the entire family instead of just one person. They also get along well with other cats. If you would like more information, please contact us at catterypurrfectpaws at gmail dot comHier klikken om te bewerken.